Together, we're counting on you to fight back against President Trump's backward agenda—to dismantle the Environmental Protection Agency, turn away from America's international climate commitments, and roll back the clean air and water protections we spent decades putting in place. It is up to all of us to defend these critical safeguards. On April 29th, people from all walks of life will be taking to the streets of DC—and cities across the country—to demand climate action. Will you stand with us at the People's Climate March? Let us know you're interested, and we'll send you details as soon as we have them—for the march in DC, or for activities happening online and right in your own backyard. 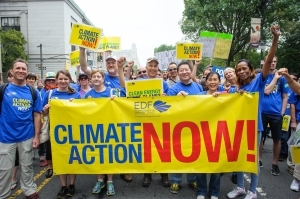 YES, I am happy to join the call for climate action on April 29th. Please send me details on how I can participate! Question - Required - What events are you most interested in receiving updates about?